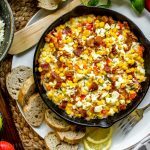 This easy Cheesy Corn Dip is full of whole corn kernels, 3 cheeses, and bacon for a creamy hot dip that will have you coming back for more. Chop the cream cheese into cubes. Place mixture into cast iron skillet. Serve immediately with crostinis or preferred crackers.